The Definition Policy relates to those items in the Special Collections which require special preservation arrangements. The policy covers all materials housed in the Rare and Vulnerable Collection, the Manuscript Collection, and the Somerset Maugham Collection. It also covers material in the Erulkar Collection and the Australian Literature Collection that would fall within the scope of the Rare and Vulnerable Collection, as well as all manuscripts housed in the Erulkar Collection. The remaining materials in the Erulkar and Australian Literature Collection, as well as the Thesis Collection and the University Collection, are kept on restricted access, but are not otherwise given any special preservation treatment. Items are housed in a restricted access area within Special Collections. They may only be retrieved by Special Collections staff and must be used in a designated reading area. All reshelving is done by Special Collections staff. Items are not available outside core hours of 1:00pm-4:00pm Monday to Friday except by prior arrangement. No photocopying is possible except with the permission of the Manager, Special Collection and Projects. No loans or inter-library loans are normally permitted. Loans for exhibitions may be permitted by the Manager, Special Collection and Projects, if suitable safeguards are adopted. Readers are required to use gloves when handling rare maps or prints. Readers must use pencils for taking notes when consulting rare items. The barcode and classmark are recorded on an acid-free card accompanying the item. No spine labels or book plates are attached to a volume. No Library markings, including ownership stamps, are made on volumes. Security strips are not inserted in volumes. Volumes are not normally sent for binding or rebinding. 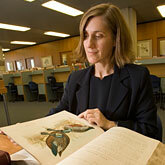 The Library’s current policy does not normally include individual conservation treatments. Where items have received such treatments, this was usually done some years ago. Some books are housed in custom-made acid-free slipcases (the so-called "Ferguson" slipcases, designed by the National Library of Australia). There is no program to extend the provision of slipcases. Some material is housed in inert plastic storage boxes designed by the National Library of Australia, or in acid-free cardboard boxes. There is a limited program to extend the provision of plastic storage boxes to more items in the collections. Some manuscripts have acid-free sheets of paper interleaved between the manuscript pages. There is no program to extend this measure to other manuscripts in the collection. Some items have been acquired in suitable acid-free cases and on acid-free paper. These are mostly expensive facsimile reprints like the Banks’ Florilegium and the Ellesmere Chaucer. There is no program of leather dressing for leather-bound volumes. Level 1 refers to items discarded from the collections after a fixed period. No discards are made from the Special Collections. Level 2A "Retain original for its useful life – without active preservation". Level 2B prescribes "appropriate conservation" measures. This is only currently applied in the Special Collections to a very limited extent, as outlined above. Levels 3 and 4 involve policies for migration of material to an alternative format (such as microfilm) to ensure its indefinite retention. The Facey Manuscripts have been photocopied and the photocopies have been bound, but no other significant reformatting has taken place. The standard airconditioning for the Reid Library building is used for the Special Collections. Temperature and humidity in the Special Collections area are monitored to ensure excessive levels are not reached. Reduced levels of lighting are used in the stack area of the collections. There is an annual inspection and treatment for pest activity. The carpets in the Special Collections area are vacuumed once a month. The books and shelves are cleaned once a year. Arrangements for filtering and reducing external light are under review.